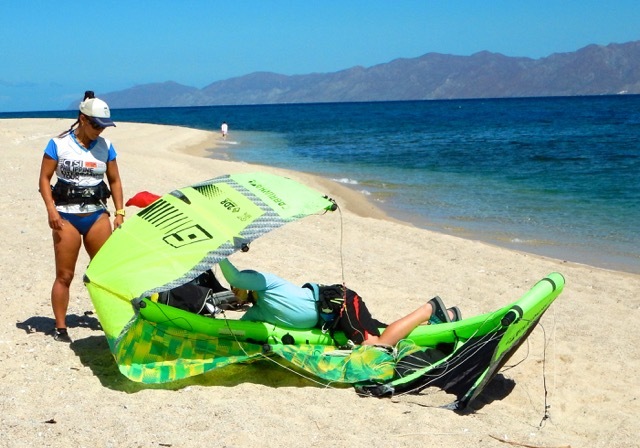 As luck would have it, we had a broader family trip scheduled to Cabo San Lucas in February so we decided to find a way to fit a kiteboarding adventure in. 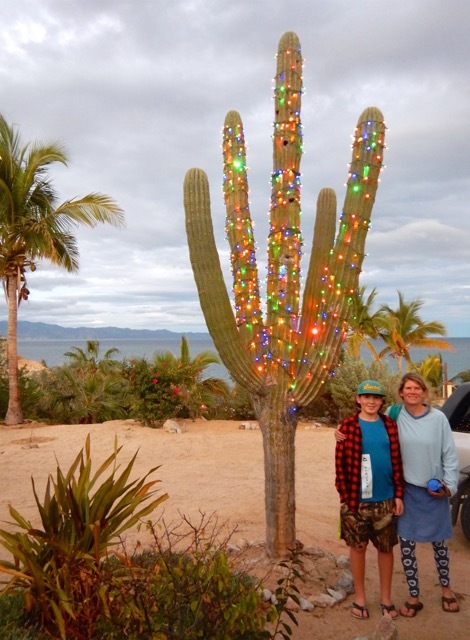 We went to Captain Kirks resort in La Ventana, which is just south of La Paz on the Sea of Cortez. It is about 2.5 hours north east of Cabo San Lucas. 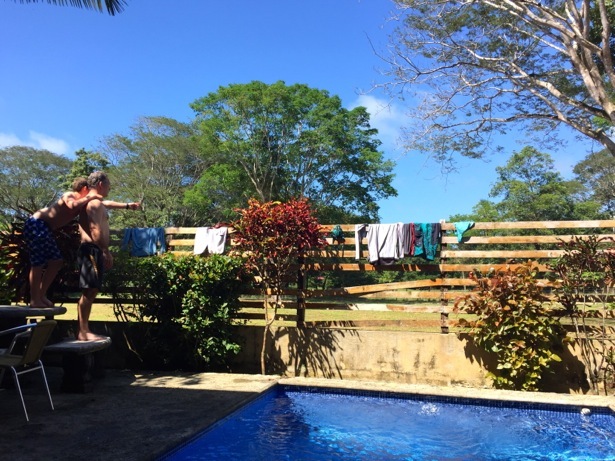 The resort was fabulous… the kite school is right on site, the accommodations are fabulous – a set of individual casas and casita’s depending the size of your group, and everything is right off the beach. 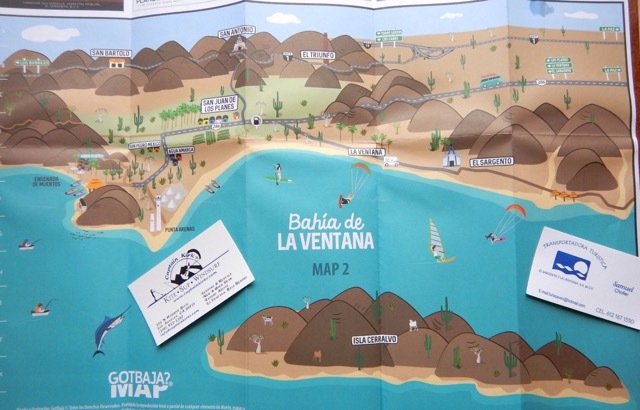 La Ventana is a very small coastal town south of La Paz on the eastern side of the Baja Peninsula. 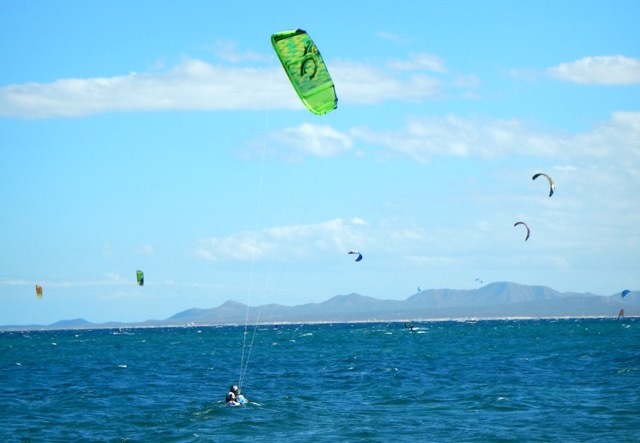 It is recognized as a fabulous location to learn to kite board due to the predictable thermal winds, relatively calm tides and the fact that the winds are mostly onshore, which means that you won’t get blown out to the ocean if you make a mistake. 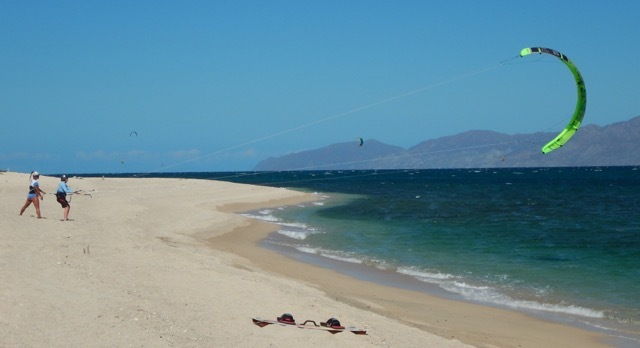 The beaches are also fairly wide with lots of room to learn to fly the kites on the sand before committing to getting dragged around the ocean. The beginner package is 9 hours, split up over 3 days, and walks you through everything you need to know to get started. It also includes all of the equipment that you will need, including wetsuits. 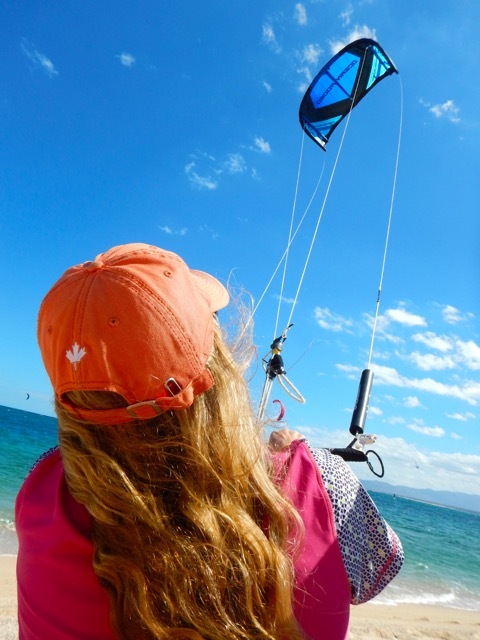 The first 3 hours is spent learning about the gear, safety and how to fly a trainer kite, which gives you a taste of the power of the wind. 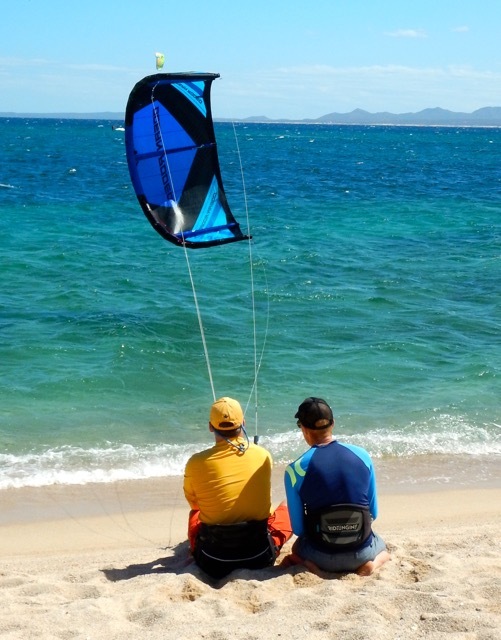 The second 3 hours steps you up into the full sized kites, you learn how to self-rescue in case of any equipment breakage when out in the water and really get comfortable launching the kite and flying it in all sorts of different positions. One of the hardest things is parking the kite straight above you at “noon” – this is basically putting it in neutral where the wind is not driving you in any specific direction. 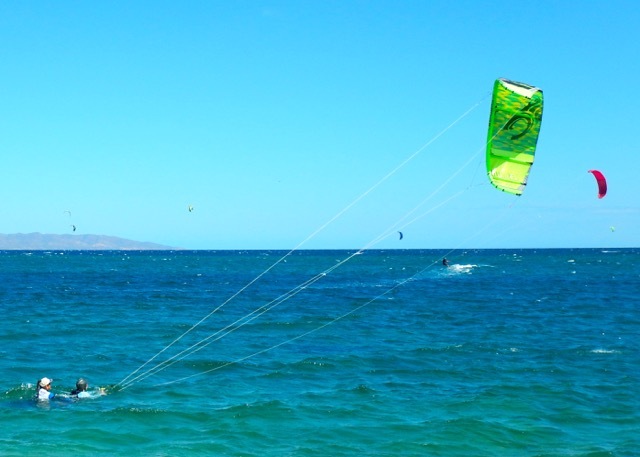 We ended our second lesson doing body dragging with the kite in the ocean, learning how to go upwind and downwind and basically go where you want with the kite. 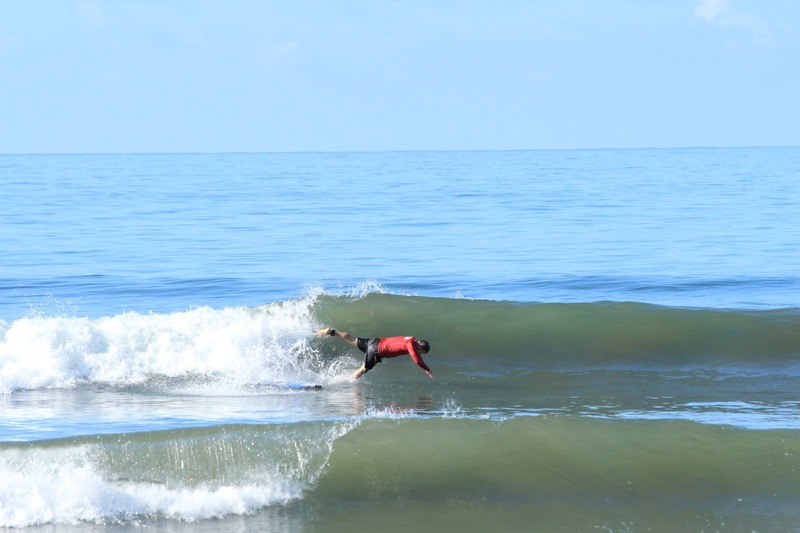 One of the scariest parts was being out in the water, trying to figure out how to get up and going and being surrounded by all these other kiters zipping by. It would be akin to learning to ski on the bunny hill, but having the bunny hill placed in the middle of a fast blue run! 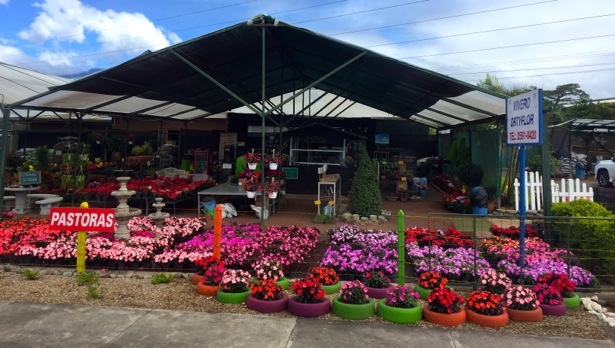 Like any sport, it all looks so easy from the outside…. Sometimes it’s tough to put yourself back in a learners mindset and be patient with the learning curve. 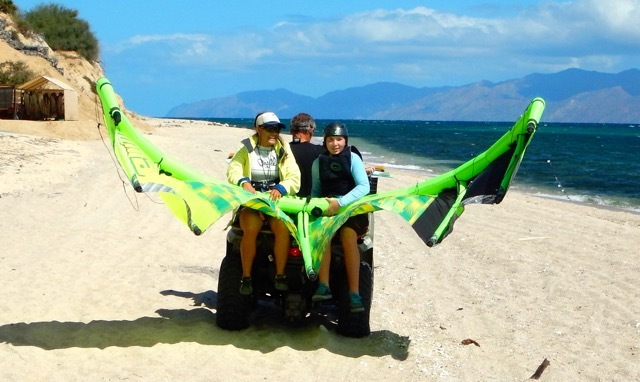 It was great having the ATV shuttle on our last day as you were able to get twice as many downwind runs in without having to march yourself and the kite back up the beach all the time. Overall we had a fun three days and definitely recommend both Captain Kirk’s and kiting for other adventure seeking families! Most people think that they can’t go off on a winter kayaking trip unless they are solid class 4/5 paddlers, and you can’t go with kids! This is absolutely not the case! Over a series of four posts, we are going to lay out our experiences and recommendations for heading south as a kayaking family. Destination #3 is Mexico, which is located in the southern most part of North America and is a beautiful country. The majority of the kayaking is on the eastern side in the regions of Valles and Vera Cruz, which are north east and south east, respectively, of Mexico City. The peso is the national currency but you can get away with US $$ in some places. 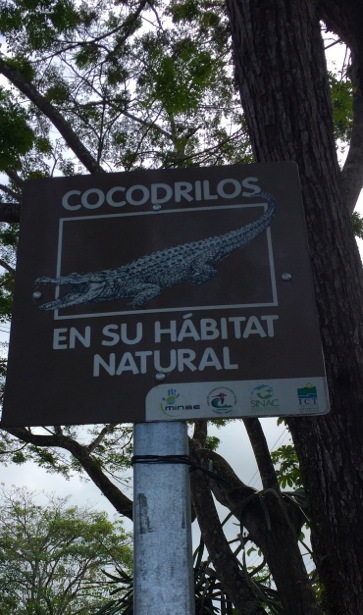 At the time that we went, this region of Mexico was considered fairly safe but that can change so be sure to check with the local tour operators. The only sketchy part was the drive through the northern region near the Reynosa border crossing as we drove from San Marcos, Texas down to Valles on both of our trips. Being in a van for 16 hours is not the most family friendly experience so we would definitely recommend flying into Mexico City (for trips to Vera Cruz) or Tampico (for trips to Valles). Mexico is not as clean as Costa Rica of Ecuador and the water should not be assumed to be drinkable. The roads are a work in progress in many regions and armed military guards are the norm as you drive through every town. Don’t be surprised when you get stopped – just stay friendly and in most cases, all is fine. The rivers in the Valles region are the most family friendly however it is a bit harder to mix and match things here. Neither of the outfitters that we worked with had the ability to provide multiple itineraries within a trip. This is a great region to learn how to do drops and slides, with most being between 5-10 feet. We did this trip the first time when Hunter was ten and anything he (or we) weren’t comfortable with him running, we tossed his boat over and then he and Tim would jump off the drop. Our second trip was when he was 11 and by then he was more comfortable with the idea of slides and drops and we would allow him to do anything up to around 10 feet. There was only one drop bigger than that (20 ft) and Hunter and I took out before it and hiked around it on the road. 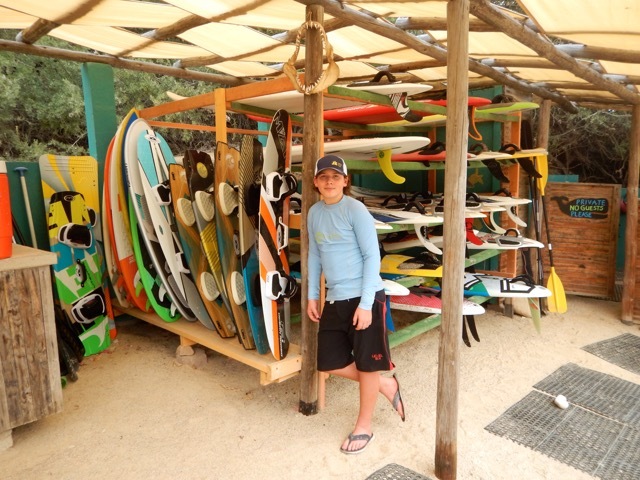 We have not yet paddled in the Veracruz region but have heard great things about it. Aventuretec is where most paddlers base out of and there is a range from class II to class V runs all within a few hours. When we travelled we went with Ben Kvanli of Warm Whitewater. He has been travelling to the region for years and takes a group down once a month from October to March each year. It is a more economical way to go as the group drives down in a van from San Marcos, Texas, and shares travel costs. It is a VERY long drive to be in a small space with kids…On our second trip to Valles we met up with Tom McEwan of Calleva’s Liquid Adventure School. He has also been running trips to both Valles and Veracruz for many years and is well respected in the region. He trailers his boats down there in November and then has guests fly in for the week. We would recommend flying in for your first trip – it is safer and will have everyone in a good mood when you get there rather than grumpy from a 16 hour car ride. 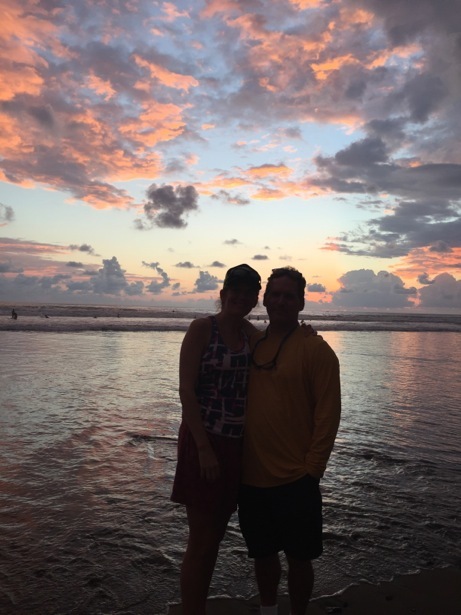 The second week of our time in Costa Rica was spent in the small surf town of Dominical, on the southern pacific coast. Check out our first post here to learn about our super fun week kayaking. According to locals it has changed a lot in the last 5 years as the main coastal road has been developed – more tourism which is good for the economy and the services but it’s also meant more people and a faster pace of life for the former hippy town. 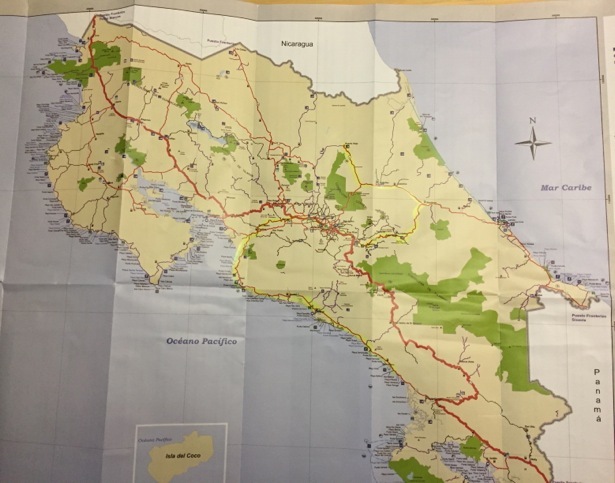 We drove from Turrialba to Cartago and then up to San Jose with the Costa Rica Rios gang and then got a ride from “Johnny” through San Jose to Ortonna and then down the coast to Domnical (yellow highlighted roads show all the places we explored in our 2 weeks). 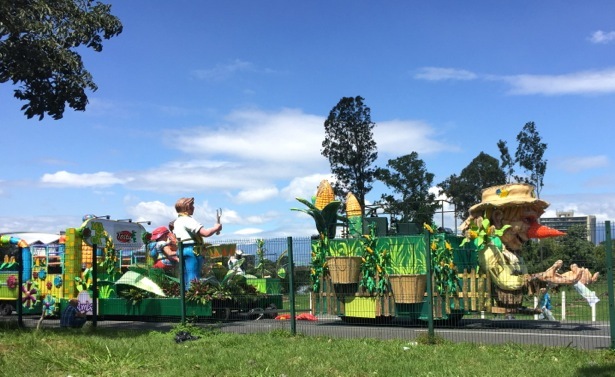 Cartago is considered by some as the most religious place in Costa Rica. It felt like a moderately large city with traffic and all the other main structures that you find in cities. 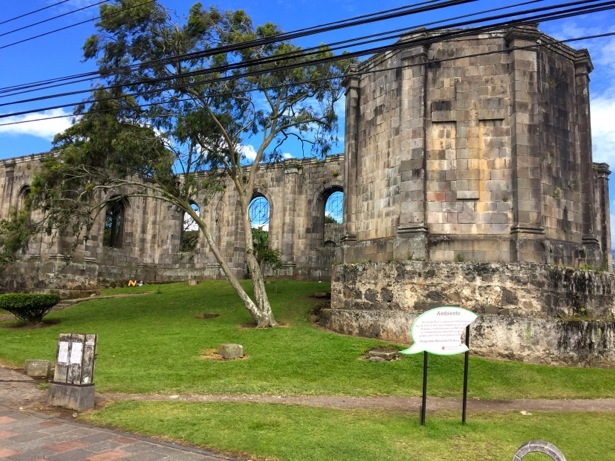 The main plaza and downtown area is dominated by the Santiago Apostol Parish Ruins, which are beautiful and function very much as a metropolitan green space. The church / parish was under perpetual construction between 1575 and 1910. A series of earthquakes brought down the churches and in 1910 it was decided not to continue with construction. No single church was ever actually completed. 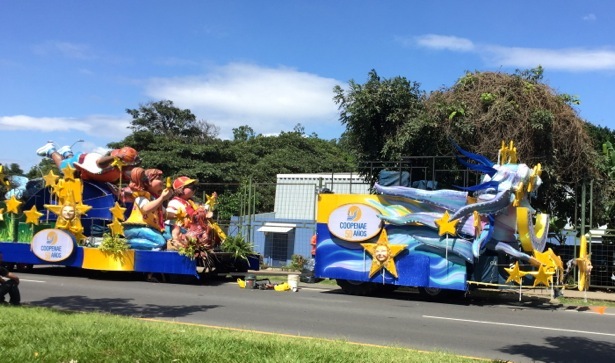 The Festival de la Luz was about to start as we were driving through San Jose so we got to see all the floats as they were preparing for the parade that evening – they are quite elaborate! 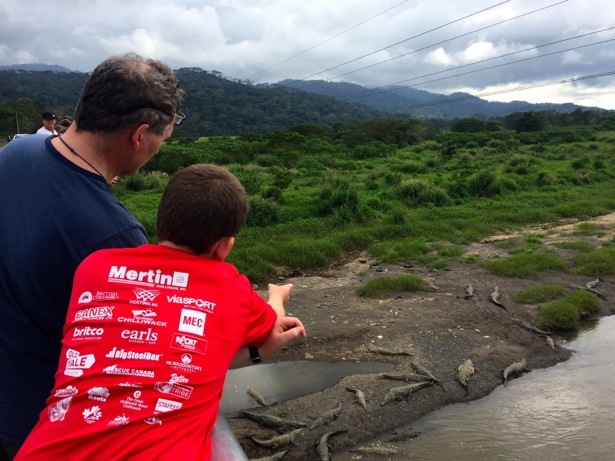 Half way through our drive we stopped at a local crocodile sanctuary – it was mind-blowing (and a little scary) to see that many crocodiles sunning themselves on the river bank. Especially when you stopped to think about the amount of time we had just spent in rivers and were about to spend in the ocean. Luckily crocodiles (and piranhas) don’t like fast moving water and we just needed to stay away from estuary areas when on the ocean. Just beyond our back fence was a large green field that came with various types of lizards and iguanas – big, small and everything in between. 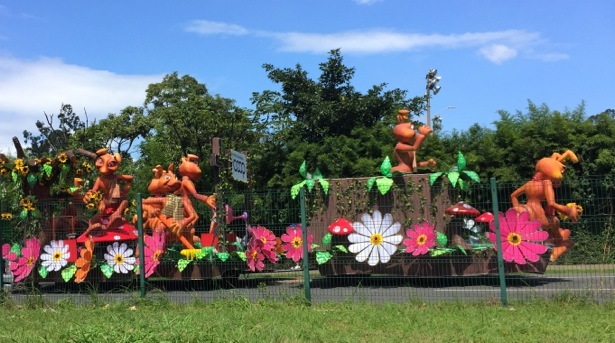 We would go in search of them throughout the day to see what they were up to. Hunter is pointing them out to Tim in the photo. Jeanine from Dominical Waverider was a huge help in getting all of our Dominical fun organized. 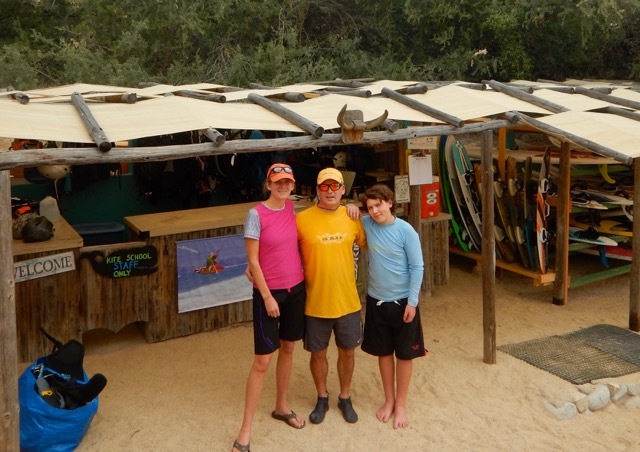 Tim, Hunter and I took surfing lessons for 3 days and the instruction was great – they even took photos of us! It was a low surf window while we were there which was good as it meant we got to surf right in Dominical (normally only for experts) but it also meant that some days it was tough to find waves. We were pretty worn out from our river adventures so not our best surfing, but we all came away with some improvement and good suggestions. 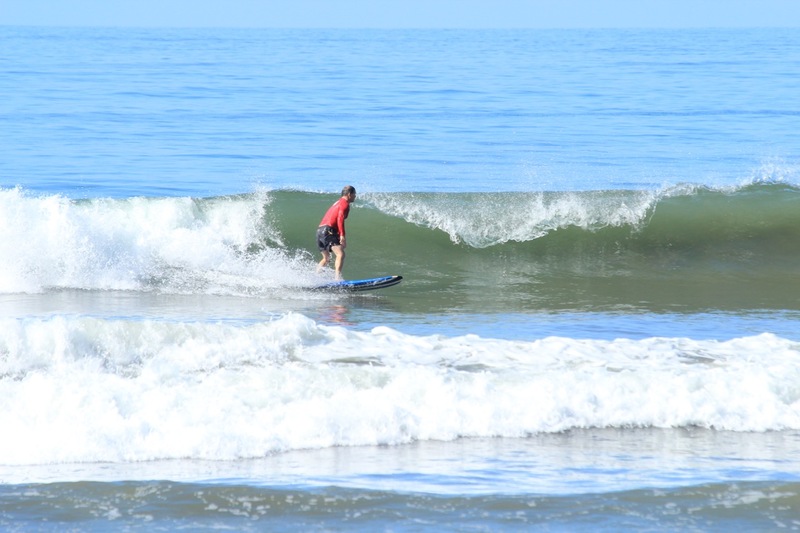 It was also great to have Hunter back out on the water surfing with us (he took a self-imposed hiatus last year). 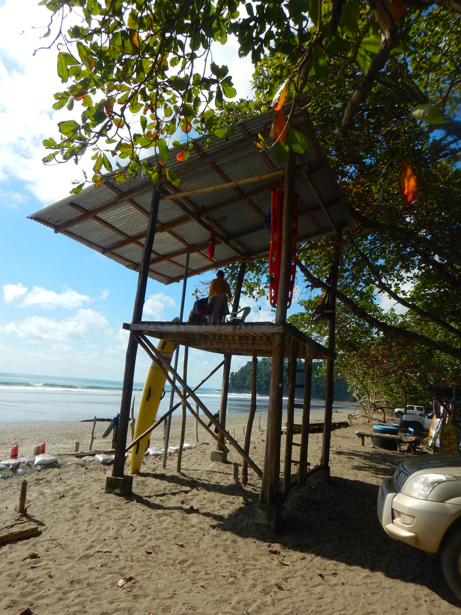 The main Dominical and Playa Hermosa beaches all have lifeguards, which is great to see and comforting as the rip tides can be quite strong at times. 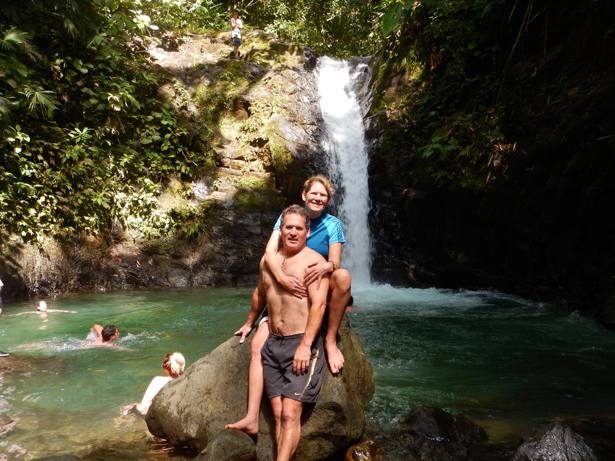 Jeanine also took us to a local waterfall – some people are adventurous enough to slide down the waterfall or jump off the top. 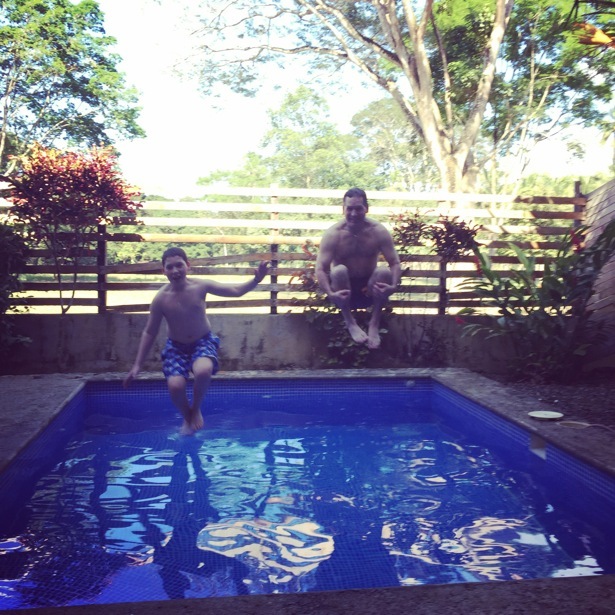 We decided to just enjoy the cool and refreshing pool at the bottom. 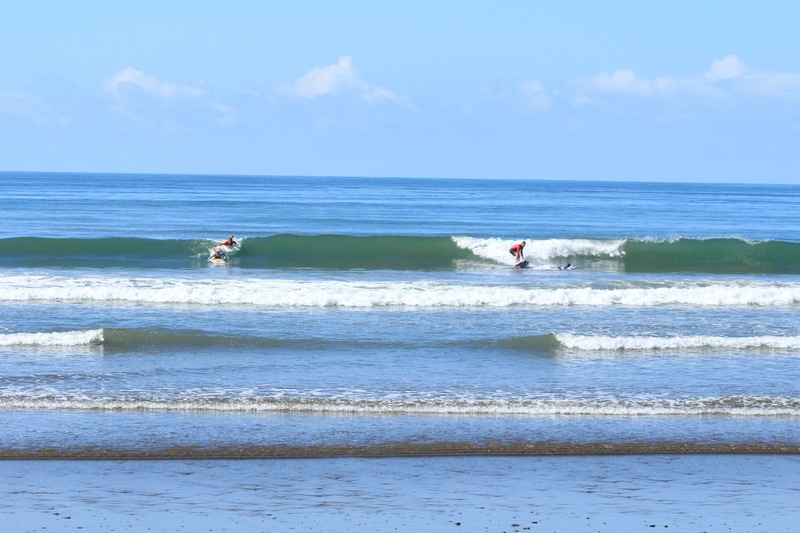 The ocean temperature was like bathwater – I found it amazing, the boys found it too warm. 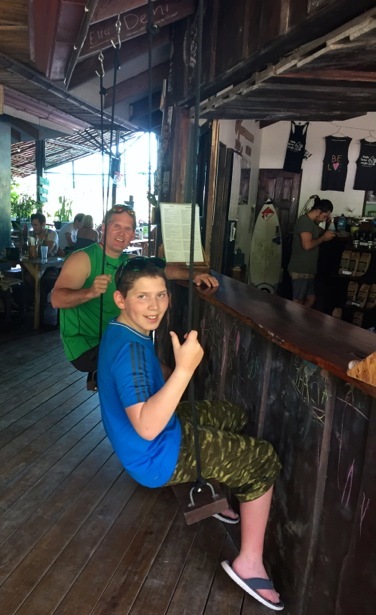 We had fun exploring Dominical and stopped in at the CongoMongo restaurant for lunch (much to our surprise it was vegetarian so I was happy, the boys not so much… but they did like the swings) and Tortilla Flats (where you MUST have the passionfruit basil margarita while watching the sunset). There are 5-6 good small restaurants within walking distance of the main area and all are worth checking out. It was fun to have some “beach time” after all the time on the river. It’s always hard to leave those amazing sunsets and head home but we did… It leaves us excited for our next beach visit. 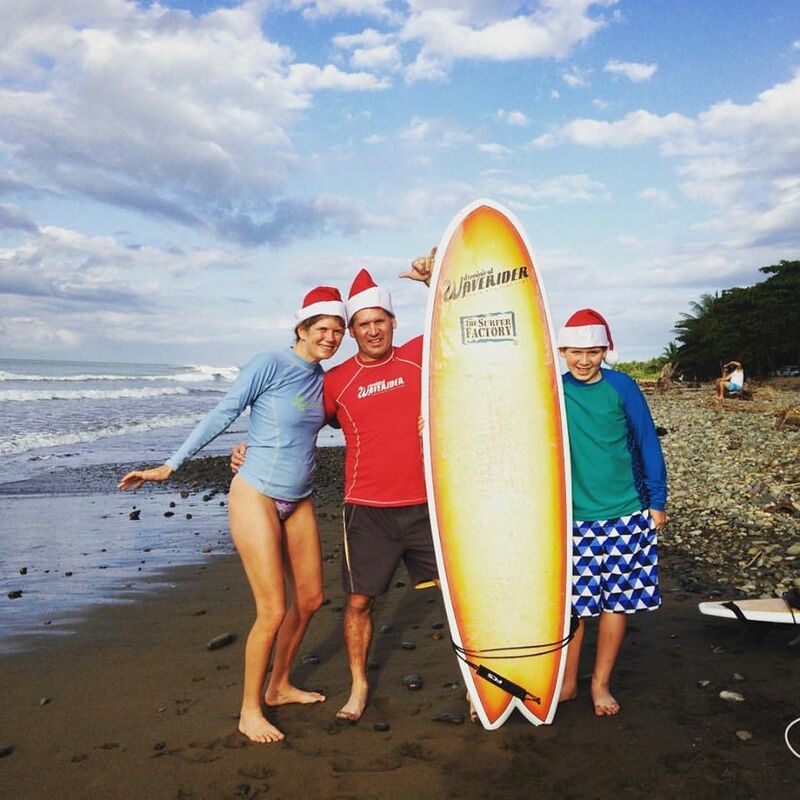 If you are looking for some surf time in Costa Rica, be sure to chat with Jeanine at Dominical Waverider – we strongly recommend them!